The North Ranch Master Plan for a 133,000-acre landholding in Osceola County received final local government approval on September 21, 2015 when the Osceola County Board of County Commissioners voted 5-0 for the plan, which is the largest land use plan ever proposed and approved in Florida. Hopping Green & Sams (HGS) attorneys David Powell and Gary Hunter helped lead the multi-disciplinary team assembled by client Farmland Reserve, Inc., d/b/a/ Deseret Ranches of Florida, in preparing and advocating the plan over the last three years. The plan covers a major portion of Deseret’s 250,000-acre North Ranch in Osceola, Orange, and Brevard counties. Because Florida law requires the plan to be determined “in compliance” with state standards, the plan is now in a 45-day review period by the Florida Department of Economic Opportunity (DEO). An earlier review of the plan in draft form resulted in DEO identifying only six features of the plan that DEO believed did not comply with state standards. Those six issues were all addressed in the final plan as approved, as were 19 suggested improvements from state agencies. The plan also incorporated numerous changes recommended by environmental stakeholders in six meetings with County staff and the landowner between November 2014 and September. The plan has a 65-year planning period and anticipates that, by 2080, 490,000 persons will reside in mixed-use centers on the ranch served by both roads and fixed-rail transit. The plan will set aside 42% of the planning area for permanent preservation as Conservation or Agricultural lands with another 15% identified for Greenways, Trails, Parks and Open Space. The area of urban development and rights-of-way constitutes 38% of the planning area. The existing Taylor Creek Reservoir constitutes another 5% of the planning area. HGS attorneys Richard Brightman, Frank Matthews and Eric Olsen also participated in preparation of the plan and working with various agencies and other stakeholders to identify and resolve issues. The North Ranch Master Plan is the largest project to date to utilize Florida’s sector planning law, which was created by the Legislature as a pilot program in 1998. In 2011, the Legislature revised the statute to make it a generally available tool for landscape-scale planning for conservation, development, and agricultural uses over periods of 50 years or longer. The Legislature made improvements in the statute again in 2015. The plan is believed to be one of the largest ever approved in the U.S., and is located adjacent to a 19,000-acre portion of the North Ranch in Osceola that was previously planned for mixed-use development in 2010 with leadership from HGS lawyers. The North Ranch includes another 72,000 acres in adjacent Orange County and 20,000 acres in adjacent Brevard County. The landowner has stated that it will work with both counties to prepare appropriate long-term plans for its other lands. The landowner expects the 20,000 acres in Brevard County—which are among the most productive grazing lands on the ranch—to remain in long-term agricultural use while the plan for the Orange County lands would be similar to the Osceola plan. 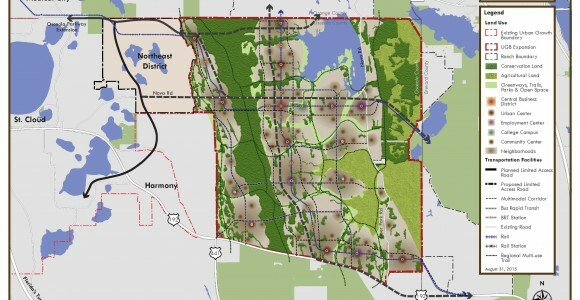 The North Ranch Master Plan was prepared in response to Governor Scott’s Executive Order 13-319, which created the East Central Florida Corridor Task Force in 2013 for the purpose of evaluating “future transportation corridors serving established and emerging economic activity centers” in Brevard, Orange, and Osceola counties. The Governor asked the task force to address the “regional connectivity gap” between the new Medical City job core in southeastern Orlando and the high-technology job core in Melbourne and southern Brevard County. Because the North Ranch lies between these existing and emerging job cores, the Governor asked Deseret to work with local governments to create a master plan for the ranch that would address regional transportation issues within a larger context of long-term conservation, development, and agricultural uses. In its final report in 2014, the task force identified four study areas for new multimodal corridors in East Central Florida. All cross the ranch to connect job centers in the region. The North Ranch Master Plan incorporates those study areas and other task force recommendations. The plan will expand Osceola’s Urban Growth Boundary to include the planning area and designate it as a mixed use district under the county’s comprehensive plan. The plan uses Osceola’s seven mixed-use place types to create 16 centers linked by a multimodal transportation system. The centers will have a minimum residential density of 5 units / acre. Major centers are planned for densities of at least 12 units / acre in order to facilitate transit as an alternative to private motor vehicles. The plan sets aside a minimum 320 acres in the central business district for a new higher-education campus next to a planned research park. When implemented, major transportation components of the North Ranch Master Plan will significantly reduce travel times between existing and emerging job cores west of the ranch in Orange and Osceola and those east of the ranch in Melbourne and southern Brevard. Economic development professionals say reduced travel times will help to grow these job cores by facilitating interaction among companies, researchers, employees and suppliers. For further information, contact David Powell or Gary Hunter.